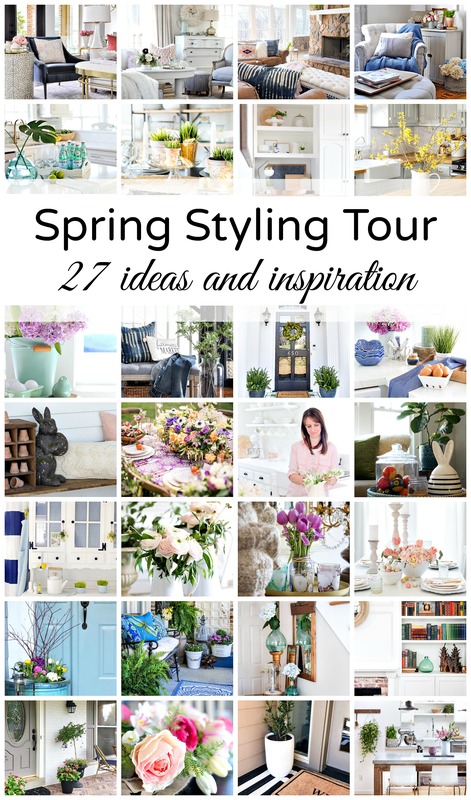 This week I’m really excited to be joining up with the Spring Styling Tour series, hosted by Jenn of Town and Country Living. Each day some amazing bloggers are sharing a room in their home all decorated for spring… but they are NOT just sharing the END result! We are all sharing the process we follow along the way! 27 posts packed full of insider tips and tricks and step-by-step ideas for how we decorate and style our homes for the season. Fun, right?!? At the bottom of the post you can check out all the tours from this week! 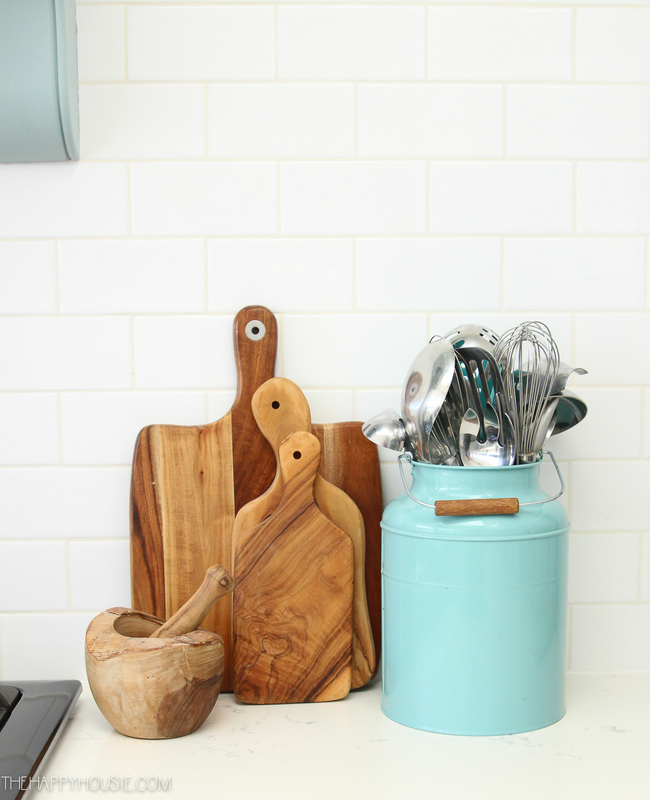 Since the kitchen is definitely the busiest and most utilized space in our whole home, I wanted to start off with a clean slate before I began any spring styling or decorating. 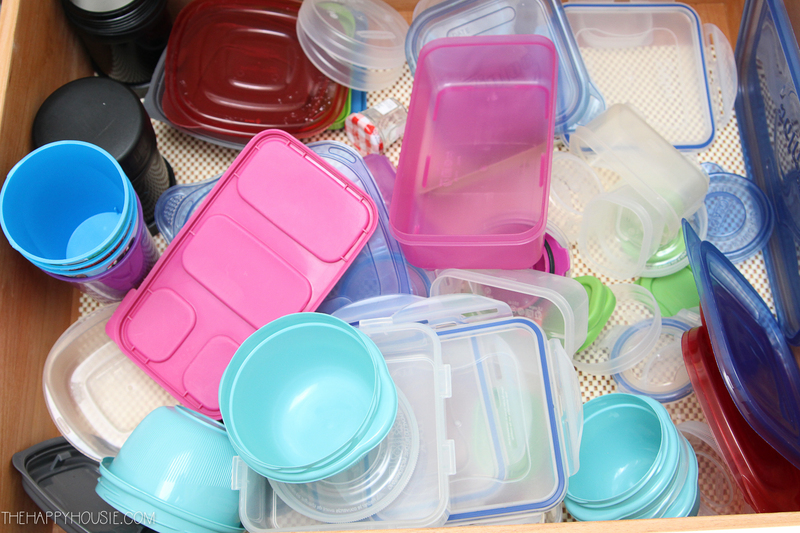 After a busy winter season of use, the whole kitchen was in need of a good, thorough spring cleaning. This is how our kitchen was looking most days throughout the winter; after the dishes had been done, of course. Most days when we are home we spread out entire life out over that counter. The boys do their homework and eat snacks there. We have casual family meals there. We visit and catch up and chat… all around that peninsula. It might be the place in our home where we spend the most time! 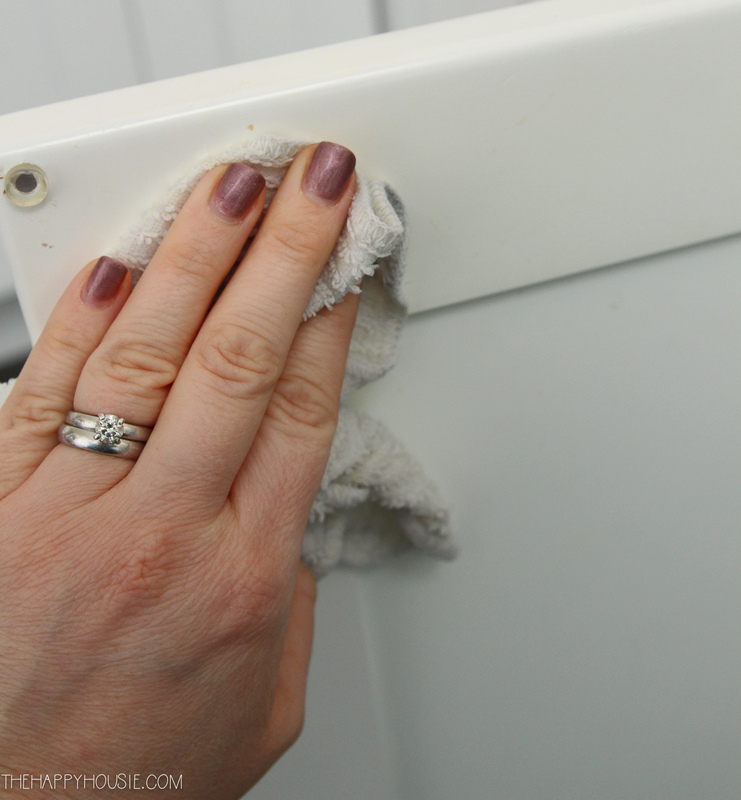 And, as with the rest of the kitchen, after so much use it was ready for a good wipe down. 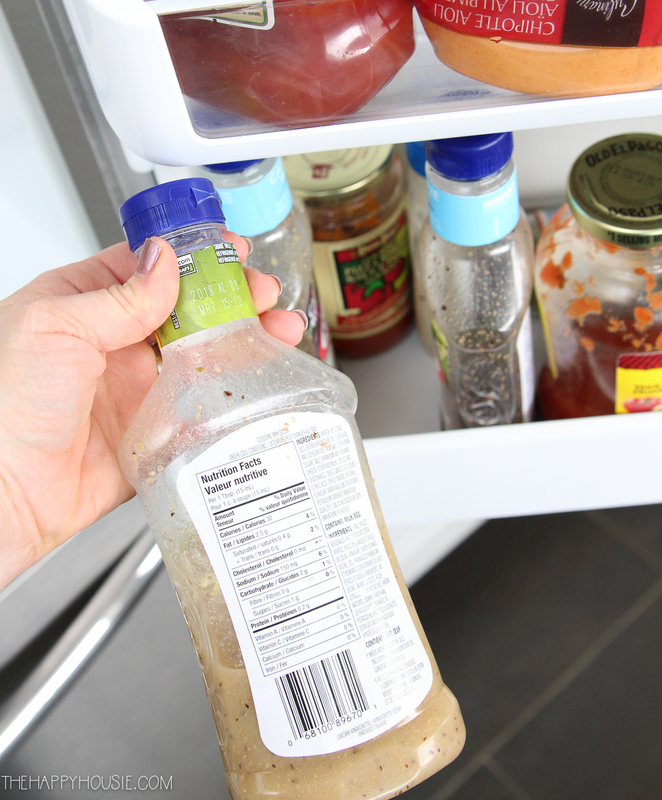 I started with the fridge and pantry, throwing out any food past it’s date and wiping down all the surfaces and drawers…. And I also gave a good overall cleaning to all the cupboard doors, inside and out, as well as to the microwave, stove, tiles, hood fan area, sink (with bleach), and countertops (moving aside countertop appliances to clean underneath and around them). 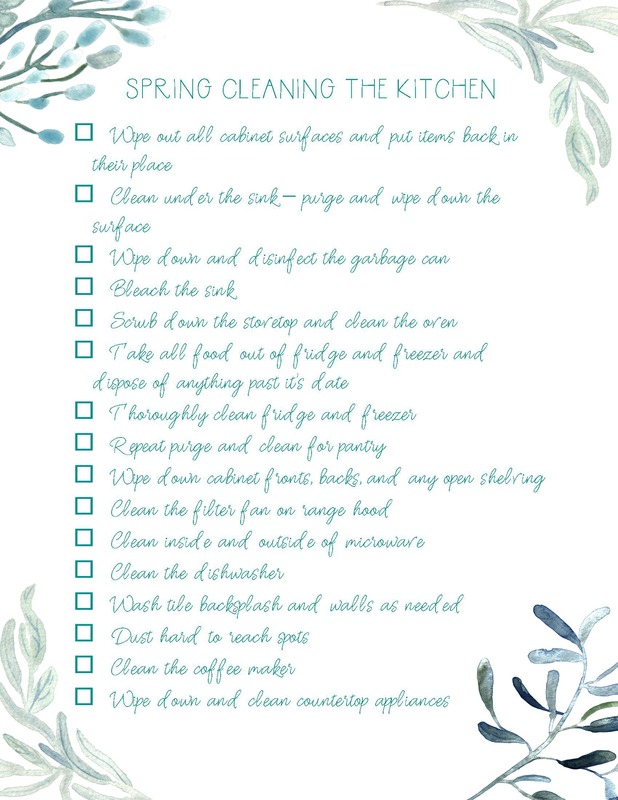 You can download and print my complete Spring Cleaning in the Kitchen checklist here! 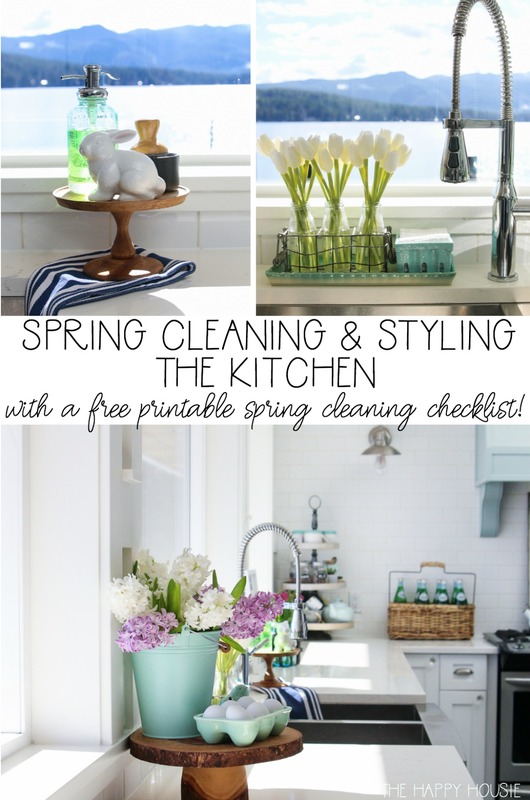 Once the kitchen was thoroughly clean (it felt good to have it that clean again, short lived as it may be) it was time for some spring styling! I had picked up some fresh dark blue towels that tie in with our blue and white drapery to swap in for spring. 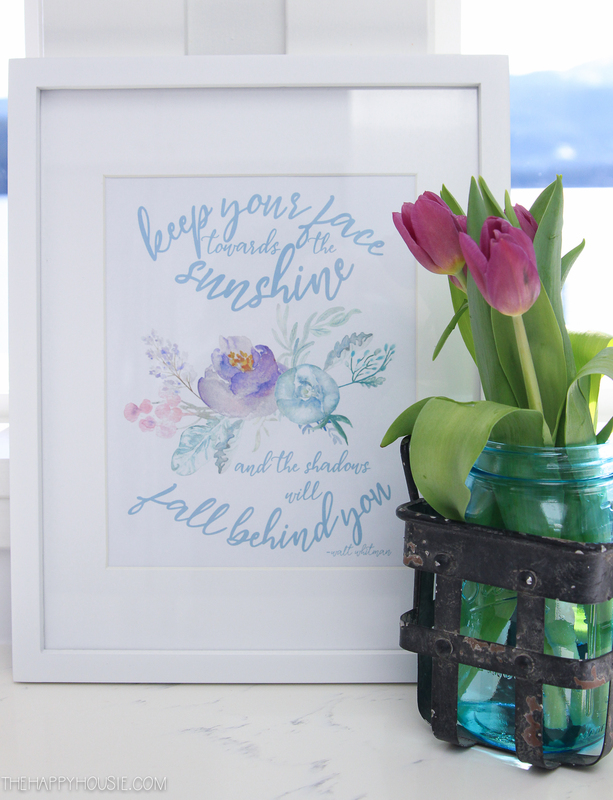 I also gathered a few accessories together and made up a simple spring printable (that I’ll be sharing with you next week). 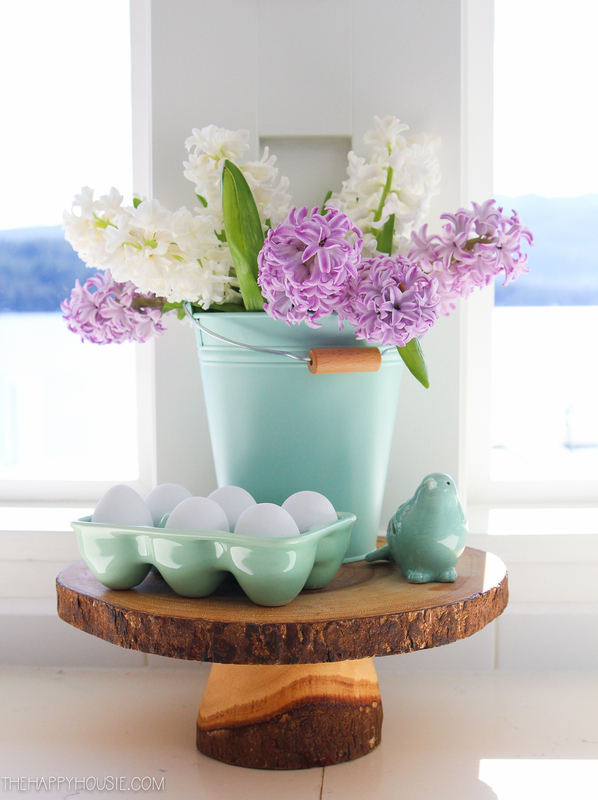 As with my mantel and vignette styling tips, fresh flowers are a lovely touch to add in the spring! 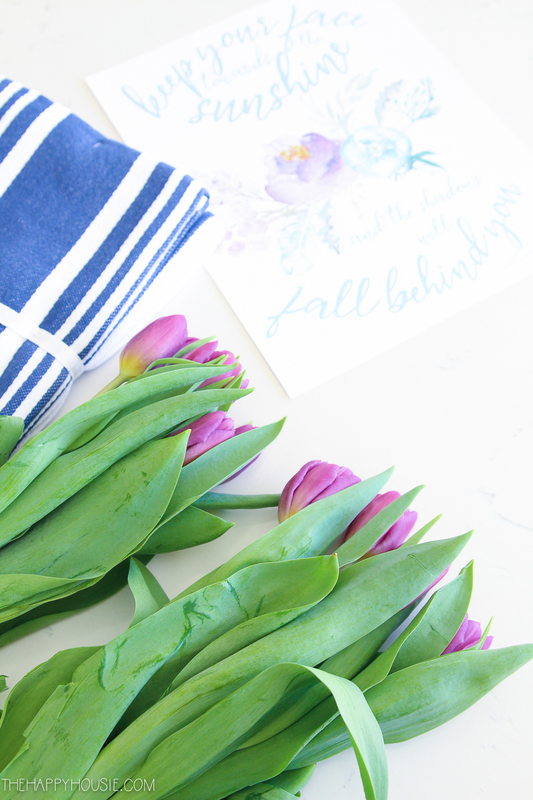 I always get excited when I see the grocery stores come out with their small bunches of tulips; and this year I couldn’t get enough of the gorgeous bunches of hyacinths I found at my local florist (you may have seen some of them yesterday on my spring dining room hutch). 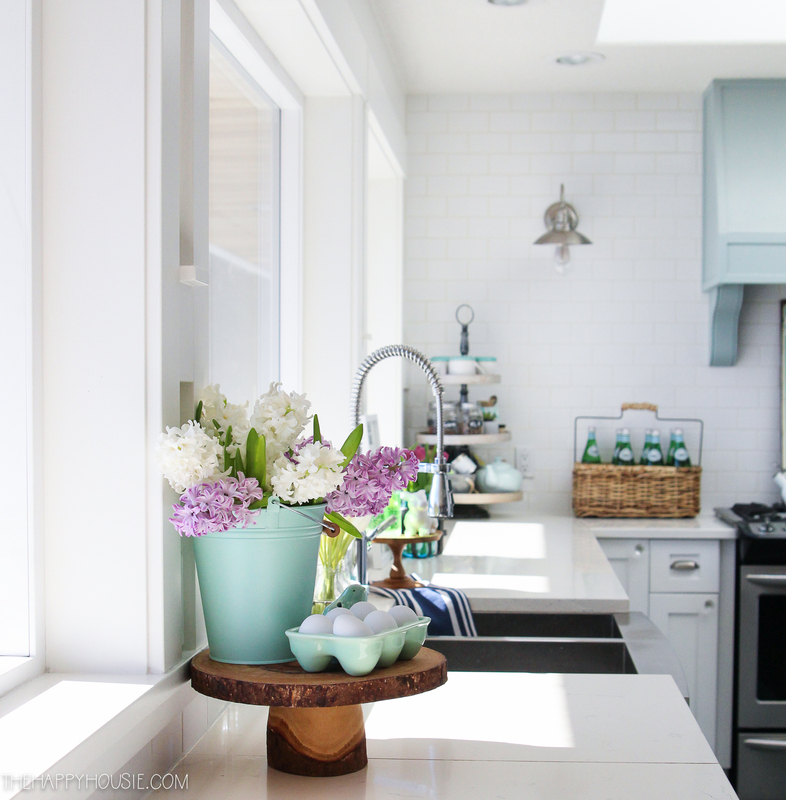 Because the kitchen is a pretty crucial workspace, I don’t like it to be too cluttered up with accessories, but adding a few cute touches here and there, along with flowers, definitely gives it that cheery, seasonal feel. 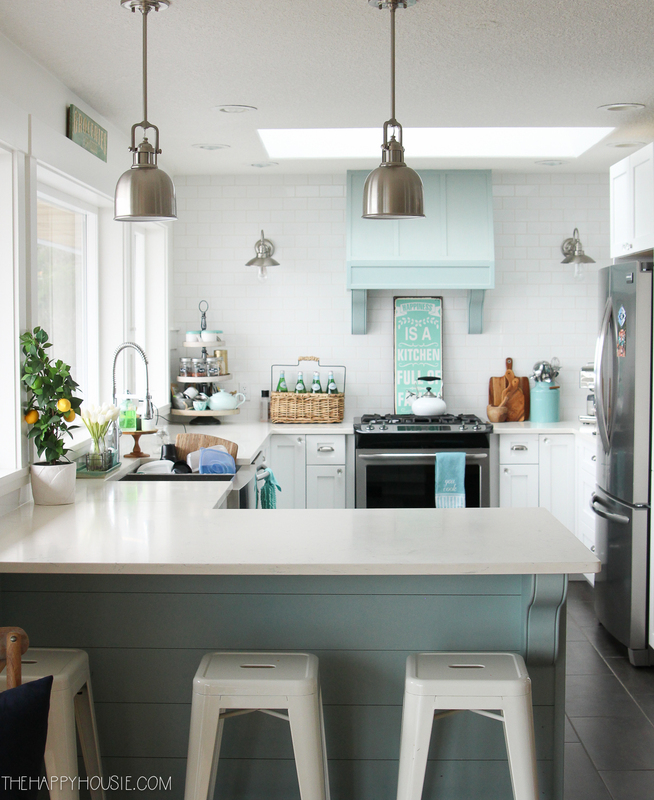 The mint green bucket is an Ikea find (of course, I had to pick up three of them just “in case”). And the tiny bird and egg holder are both from Michaels (last year). 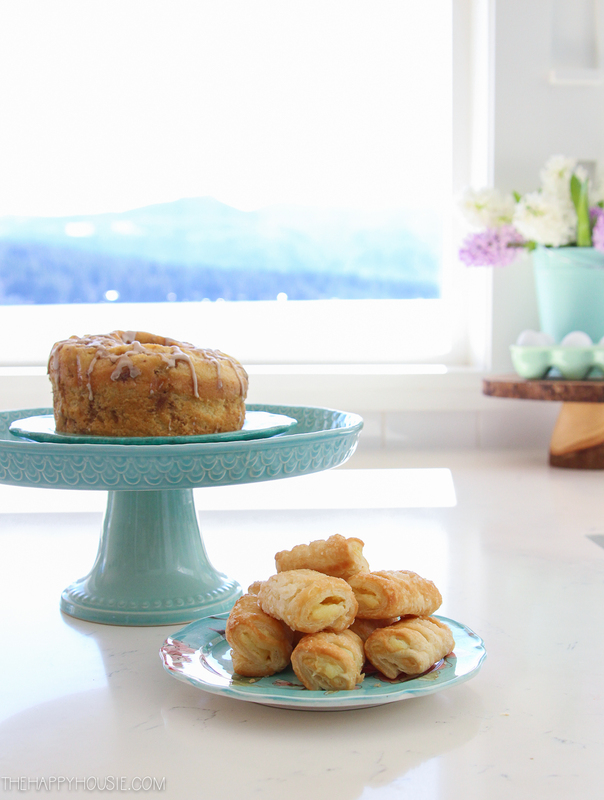 I picked up the wooden cake tray at HomeSense a few seasons back. Nope. They aren’t! Can you believe it? I found these faux tulips a few years back at my local dollarama and I have to confess that I bought them out of all they had! 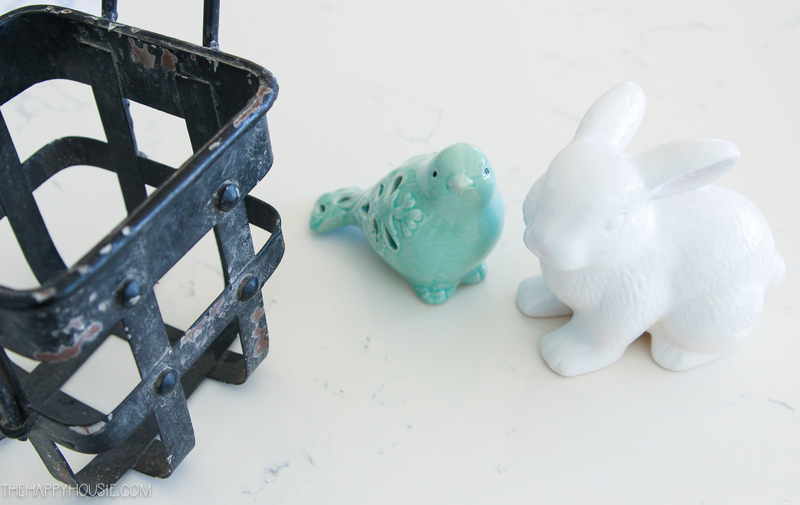 They are so realistic… I love using them year after year and I think they’re the perfect thing for in front of our freshly scoured sink. Having freshly scrubbed tiles and a freshly cleaned stovetop feels so good! I kept our etagere shelf fairly simple, and just added a tiny little spring bird and some of those faux white tulips in a vase. A nod to spring without going over the top; especially since there is so much springy colour in most of our usual decor items. Spring has almost made our way through the whole house. 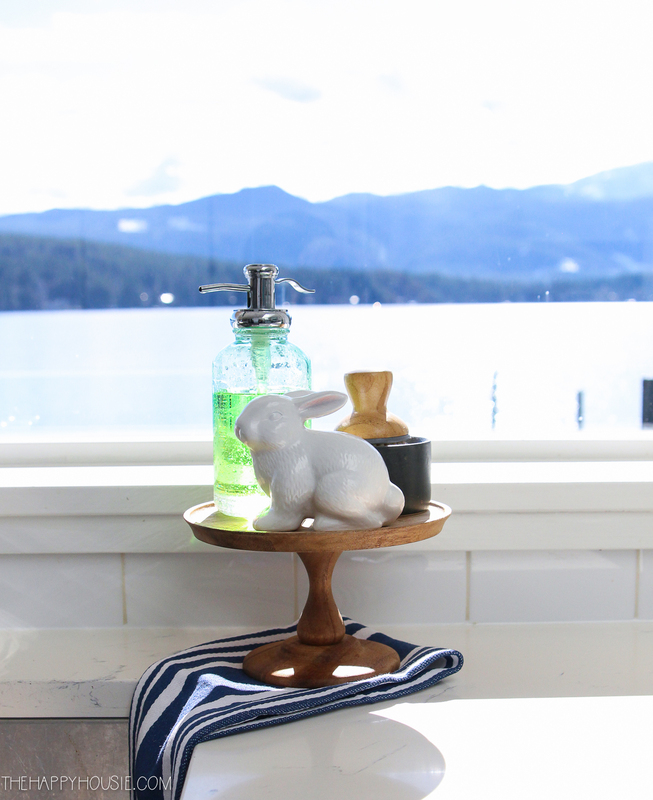 Yesterday I shared our spring mantel and dining room hutch vignette; the day before I shared our spring living room. I’ll be back soon to share the rest of our spring dining room and master bedroom, along with some changes to our porch and foyer! Did you see something you love? Here are my sources, or similar finds for your shopping convenience! What stunning ideas, right?!?! I can’t wait to take it all in! 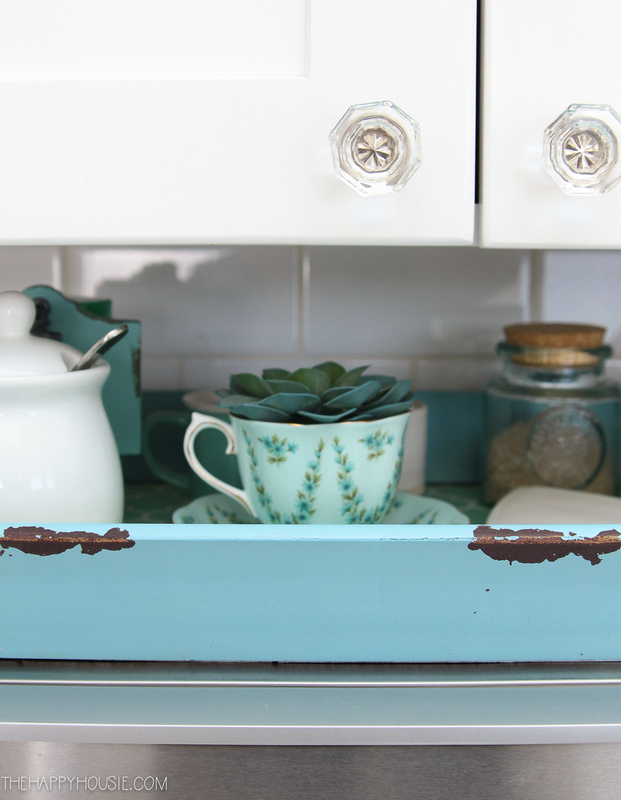 Do you know what the color of the blue green paint is under your island? Love it! Firstly, I needed that checklist so THANK YOU! 😉 Ugh, cleaning is not the funnest, but the results are always so satisfying! Your kitchen is always so bright and cheerful, I love how you style for the seasons is this gorgeous space – and that view, sigh! 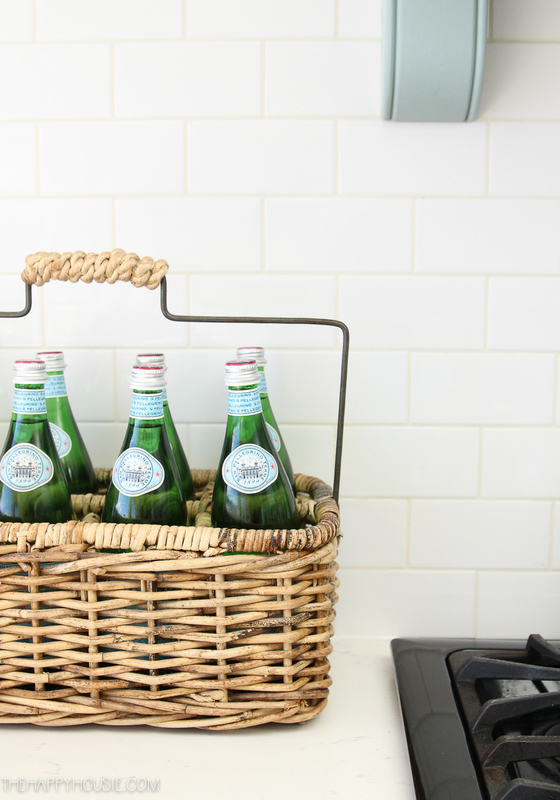 Your kitchen is so refreshing. I love it. 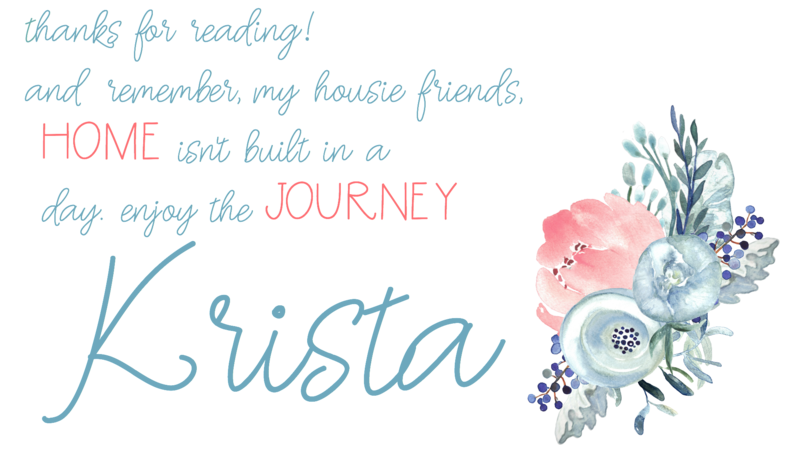 Your home always makes me smile, Krista. It’s such a cheery place and I can’t imagine ever being in a bad mood if I lived there! So pretty. Thank so much for being on this week’s tour!! Aw, thank you Jenn! And thank you so much for all of your organizing!! I love this idea for a series- so great for readers! Your pictures always make it smile, Krista! Your kitchen has so much charm that it should be in magazines 🙂 Loving your spring touches. 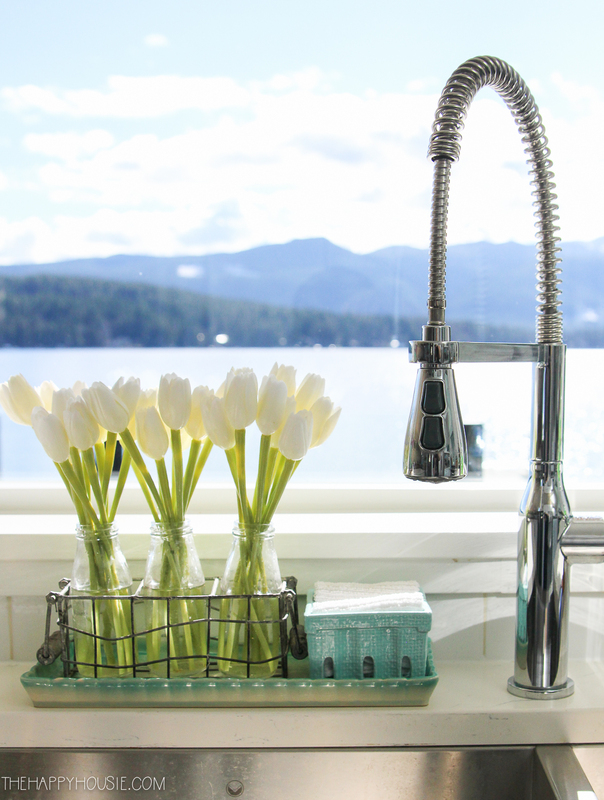 i think doing dishes could actually be fun if I had that gorgeous view doing them! 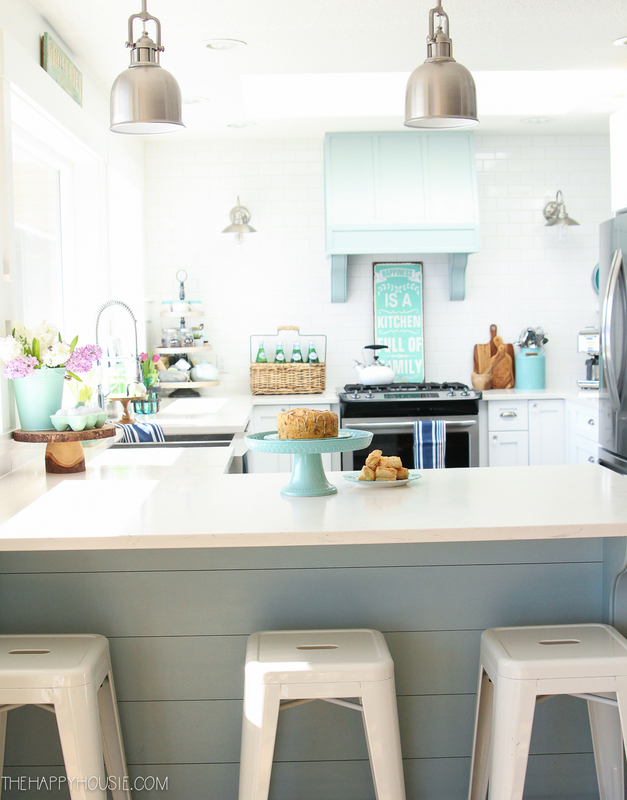 your kitchen is so pretty…and bright. 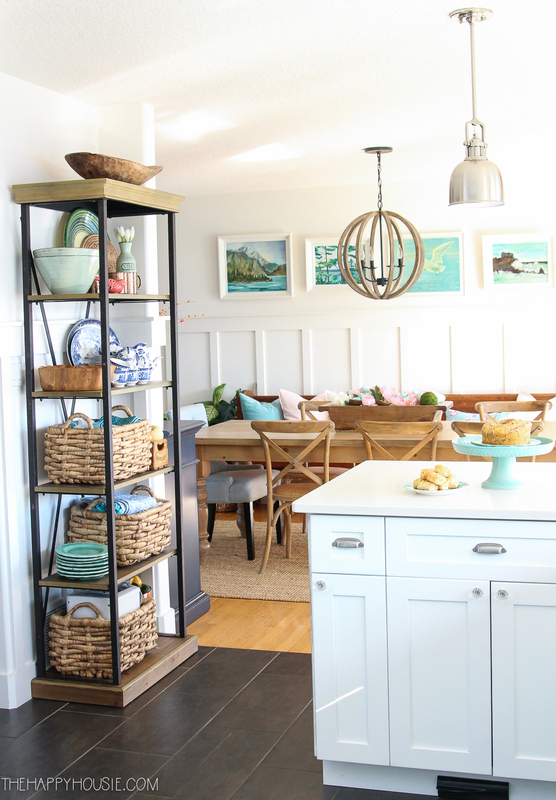 Your kitchen is such a coastal dream! That blue pail and flowers is just too pretty. Beautiful space Krista! Thank you Amanda! I love those sweet little pails -they were an Ikea find last spring.